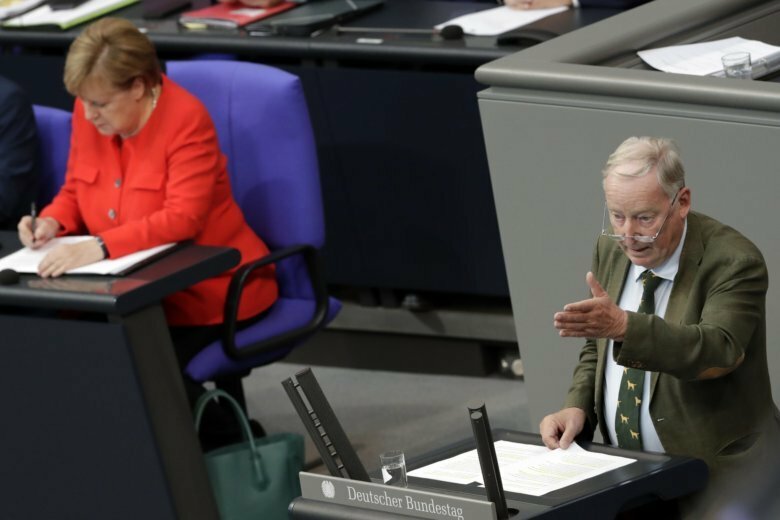 BERLIN (AP) — Chancellor Angela Merkel assured parliament Wednesday that she takes seriously Germans’ concerns about crimes committed by migrants and pledged a strong response, but condemned recent demonstrations as “hateful,” saying there is “no excuse” for expressions of hate, Nazi sympathies or violence in response. “There is no excuse or justification for hate, for the use of violence by some, Nazi symbols, hostility against people who look different, who own a Jewish restaurant, attacks on police — and heated debates about whether it’s hate or a hunt don’t help,” Merkel said to applause. But Eva Hoegl, a senior lawmaker with the center-left junior party in Merkel’s governing coalition, the Social Democrats, said her party has “strong doubts” Maassen remains right for the job.